The bad news is “The U” is not officially back. 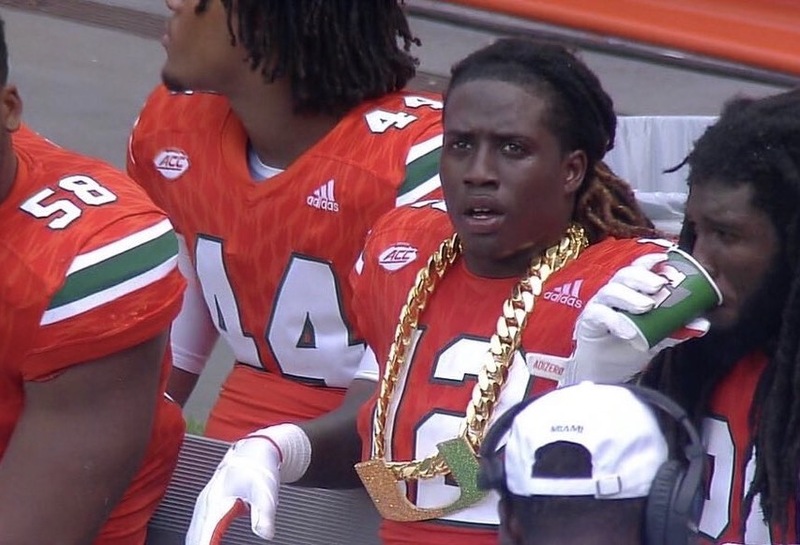 Good news is when the Miami Hurricanes do return on this journey back to swag prominence it will be with the turnover chain. The chain is out your mind colossal, and it is here to stay. Nearly 64,000 fans were in attendance at Hard Rock stadium for Miami’s primetime win over Virginia Tech which led to Miami being ranked seventh in the college football playoffs as they host the Notre Dame Fighting Irish who the playoff committee selected third. The 8-1 Fighting Irish, 8-0 Hurricanes. The Catholics versus “The U” has significant relevance again. Nearly 70,000 are expected to be in attendance. That large chain will be the proverbial 12th man for the Hurricanes when they host Notre Dame under the lights. When I say “swagu” I mean… 36 inches long and five-and-a-half pounds of 10K gold “Cuban Link drip. The creator, AJ Machado, a Cutler Bay jeweler known as “A.J. the Jeweler” whose customer list includes hundreds of celebrities, NFL and NBA players. Machado was informed by coaches they want to “bring back the swag” to The U. The idea of your bubble gum chain found in the quarter machine wrapped up in the plastic shell was out the window. Instead, something personifying Miami: swag, flashy, loud and gaudy. A couple of weeks later an immense, fat Cuban link with a massive “U” charm filled with orange and green sapphire stones was born. The turnover chain made its debut September 2nd vs Bethune-Cookman when sophomore defensive back Malek Young in the fourth quarter intercepted a pass in the end zone. Young was awarded for his interception. The rest is history to this day. Hurricanes have forced 20 turnovers through eight games; Miami forced 19 turnovers all of last season. Four different Hurricane players wore the chain in their primetime win over Virginia Tech: Defensive backs Jaquan Johnson and Sheldrick Redwine, Defensive linemen RJ McIntosh and Jonathan Garvin. 15 defensive athletes have experienced dripping in “swagu” on the Miami sideline. Miami is first in the ACC and sixth nationally with a turnover margin of +10 (1.43 per game). Hurricanes four interceptions versus Syracuse were the most picks by a Hurricanes defense in a single game since recording four against Savannah State at home September 21, 2013. Turnovers on the Miami home field have become celebrated like a touchdown. When the player sporting the turnover chain is shown on the four jumbo screens, an added eruption from the crowd ensues. “I knew it was going to be big because no one has done the chain, but this has been crazy,” Machado said. The price tag remains a hush-hush. When Machado delivered it to the Miami coaches ten days later, they were in disbelief. Diaz planned to show it to his players the morning of the season opener against Bethune-Cookman. The only object big enough to fit the chain was an old poker-chip case Diaz had in his house. So he emptied out the poker chips and put the chain in. The chain spends the week in a secret place and comes out only on game day. This college football season you have teams, coaches, players and the turnover chain. I am not surprised The U is who represents it. The massive size item has become more colossal than it actually is moreover will only continue to grow. Counterfeit chains are popping up all over the country. Adidas who is in year two of a 12-year deal with the Hurricanes designed a T-shirt that has the turnover chain printed on its front. Former UM player D.J. Williams’ company Dyme Lyfe has sold $200,000 worth of turnover chain shirts and counting. Expect turnover chain images on cups, iPhone cases you name it. Demand is high and it will continue to grow since everyone wants a piece of the Cuban link. Fans love it, players are motivated by it. Many colleges have ideas to reward their players during the game after a turnover, but does that reward coincide with that school? A big, gold, Cuban link chain is Miami. It fits the program; it fits the culture of where they are and going. ESPN’s College Gameday will be taking their talent to Coral Gables, FL leading up to The Catholics versus the The U game. This is the seventh time College GameDay has been to Miami for a Hurricanes game, but the show’s first visit to Coral Gables. UM has a 5-1 record in the previous six games. What are the chances when Lee Corso picks the winner of the game if the Hurricanes he will wear the turnover chain? 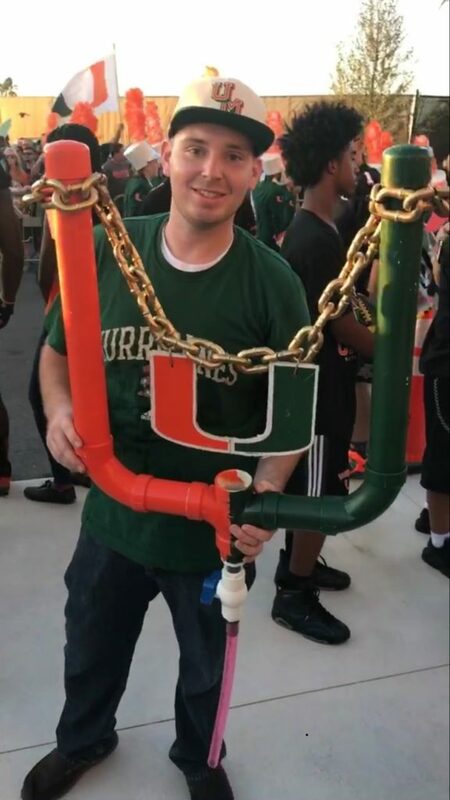 If Miami wins not only will The U take make leaps of being back, chances of wearing championship rings with the chain will look very promising.